Fiilex announces the C360 and C365 Compact LED fixtures. 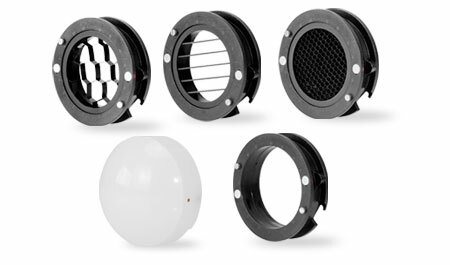 The C360s are the first Fiilex products designed specifically for use with standard pipe-clamps, making them perfect for small-to-medium studios that require a versatile, broadcast-quality lighting solution. Their design also includes an integrated power supply, greatly simplifying overhead cable management. The C360s are compatible with a wide range of light-modifying accessories. Smaller magnetic attachments include diffusers, fresnels, honeycombs, and gel holders. The safety-minded design of the C series includes integrated lockdown screws for available accessories. The C365 features the 5" Zoom Fresnel, a powerful attachment that narrows the C365's beam, increasing intensity by 800% at full focus. Each fixture is also RJ45 DMX512 compatible, allowing users to operate them remotely via the Fiilex DMX Controller, or any standard DMX board. In addition to being extremely low-profile, these 90W lights boast many of the same advanced control features of the Fiilex second generation P-Series, including wide-gamut color tuning, full dimming, and hue adjustment. At every setting these lights maintain excellent 95+ CRI. • Extremely compact footprint ideal for smaller studios with height restrictions. • Integrated power supply for easy rigging. Please contact Colin P. King, Director of Marketing Colin@fiilex.com to arrange for hands on product reviews or for additional questions. In 2001, DiCon Fiberoptics. Inc, a leader in Photonics, recognized the potential of LED Technology to revolution the lighting industry. They gave their engineers the difficulty task of designing and manufacturing a best in class LED. It had to be bright while maintaining a high quality of light, it had to effectively disperse heat, be as small as possible, and be color tunable. After 7 years of dedicated research and experimentation, DiCon created and patented the Dense Matrix LED. The Dense Matrix LED, allows for more LEDs closer together on a single array. This allows for all the chips to emit through a single lens, making for an effective point source light, that creates a single shadow. The array consists of multi channel LED's which gives the ability to color tune the light.